GLOW, Netflix's glorious comedy about the making of Gorgeous Ladies of Wrestling (a real show from the 1980s), returns for a second season on June 29 and it's full of fractured relationships, fierce females, funny ladies…and French fry accidents? The first season revolved around the assembly of the ladies by Sam (Marc Maron) and culminated in their first televised wrestling match. Throughout this, former friends Debbie (Betty Gilpin) and Ruth (Alison Brie), had to put their differences aside (Ruth had an affair with Debbie's husband) to put on a show. This year? "Season two is difficult for Ruth, I would say," Brie told E! News. "It's a rocky road in season two for Ruth and Debbie. I would say their friendship is worse off than it was in season one. Season one it felt very much like the will they/won't they of the show. They allowed themselves to be together in the wrestling space without even addressing the big issue looming over their friendship, so in season two that stuff has been bubbling under them still," she said. However, Brie teased viewers will see glimpses of the two friendly, but we also "get to see the darkest of dark stuff unfold." "It seems like they have years of issues that have been building up that they've never talked up. It certainly reaches a fever-pitch in season two," Brie said. As for Ruth and Sam? Expect some meanness. "It starts off heavy," Maron said of the season and the relationship between his character and Brie's. "You were real mean, right away," Brie said. And some of the meanness from Maron wasn't scripted. See what they had to say about their characters' journey together in the video above. 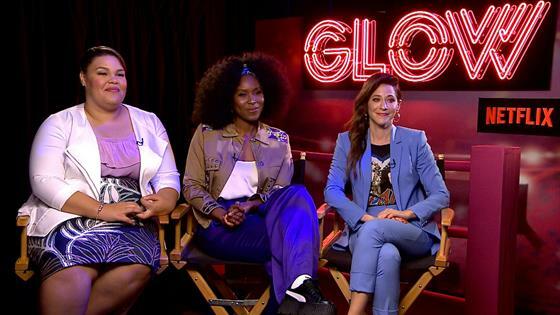 The ladies of GLOW are famous! Well, sort of. "It's sort of their lives as micro-celebrities, and people interested in them now and what their lives are like now that they have six to 10 fans" Jackie Tohn, Melrose on the series, told us. And no, you're not seeing things, that is Sydelle Noel sitting between to Tohn and Britney Young in the video. Cherry "Junkchain" Bang is back? Maybe, just maybe. Watch the video to hear what she had to say. In an early season two episode the characters go to a mall for some 1980s shopping mall fun. "That day was amazing and so fun," Tohn said. "None of us really get hurt in the ring, but I did almost get impaled by a French fry…I had a fight with Sheila and I, like, slid on one and really hurt my back. I was like, ‘On a French fry?!'" Watch the video above for more. GLOW returns for season two on Netflix on Friday, June 29.